Songs have always been a huge asset in all Nandini Reddy films. The talented director is back with her latest film Kalyana Vaibhogame which has music by Kalyan Koduri. The music album is already out in the market and let’s now see how it sounds. Analysis : The album kicks off with a happy wedding song Chakkandala Chukka. What hits you instantly are the wedding mantras which are sung beautifully by Kalyan Koduri. There is a festive atmosphere throughout the song and Sunita’s singing makes the number even more lively. The tune is quite pleasing and the traditional music arrangements compliment the lyrics supremely well. This song will hit you even more after you watch its colourful visuals. Analysis : The second song in the album is Chirunavvule which is a simple yet upbeat number which is full of fun. Once again, Kalyan Koduri makes things decent by opting a simple and old school tune. Interesting aspect of the song are the quirky lyrics which gel with the mood of the song. A romantic number which will grow on you once you listen to it multiple times. Analysis: Next in line is ‘Pal Pal’, a youthful number which has both Hindi and Telugu vocals. The singing is good and the tiny Telugu rap which comes in between has been executed well. Once again, this is a song which will be liked even more once you see the visuals and go with the flow of the characters. Analysis: Moving forward, the fourth song is Manasanta Meghamai which is probably the best song of the album. This romantic ballad hits you right away as Kalyan Koduri takes you on to a romantic journey with his beautiful composition. What’s more fascinating is Chinmayi’s superb singing which takes the song to another level. The soulful lyrics, tune and gentle yet romantic feel makes this song one of the best slow numbers in the recent times. Analysis: The fifth song in the album is ‘Pelli Pelli’ which is a humorous take on marriage. Kalyan Koduri makes this song quite interesting by making several artists from the film sing some satirical lines of the number. The hilarious Telugu rap sung by Dhanraj is very good and gives a unique touch to the number. Analysis: Kalyan Koduri sums up the album with a hard hitting heart break song Evaru Neevu. Sung beautifully by the talented Vijay Yesudas, this montage number has some beautiful lyrics which will move you. The composition is quite simple and is in tune with the depressing mood of the number. 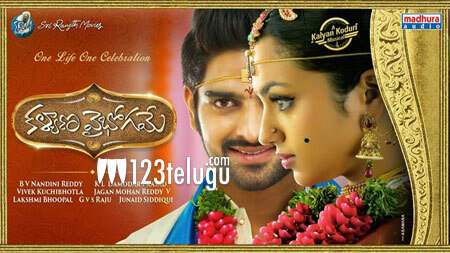 On the whole, Kalyana Vaibhogame is yet another pleasant album from Kalyan Koduri. All his compositions are situational and are devoid off any chaos like in every music album these days. Chakandala Chukka, Chirunavvule and Masanta Meghmai are our picks and will have a soothing effect on you. This album will cater to you even more when you watch Nandini Reddy’s colourful visuals on screen.